The Fredericksburg Agricultural Fair was established in 1738 when the Virginia House of Burgess authorized, and directed, that “fairs should be held in Fredericksburg twice a year for the sale of cattle, provisions, goods, wares, and all kinds of merchandise”. It is the oldest fair in Virginia and even the United States. In 2017 the Fair will be in its 279 year. Entertainment was plentiful – 1752 – a Company of Comedians from the new Theatre of Williamsburg performed at the June Fredericksburg Fair. Horse racing was very popular in the early Fair Days and in 1751 a purse of 50 pistols was offered by Charles Colson of Long Ordinary on Caroline Street. By 1774, the Fredericksburg Jockey Club’s race meets were seen during the June and October fairs. 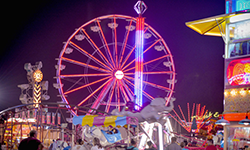 The Fredericksburg Agricultural Fair takes the place of the Harvest Season fairs of old. There were no fairs in Fredericksburg from 1881-1886. The Fair was brought to life again in 1887 and by the turn of the century there were circuses, hot air balloons and thousands of entries. As farmers struggled during the Depression, the tradition of the fair slipped. For 16 years, beginning in the mid 1920’s the fair wasn’t held. In the late 1940’s a group of farmers formed a fair association. The local Jaycees decided to help. They met every month but it kept on and nothing happened. Finally, Spotsylvania County farmer John Orrock said, “If we’re going to have a fair, we’ve got to have someone to do it.” J.E. (Gene) Rowell, who was a member of the Jaycees, and had been attending the meetings, stepped up to the plate. Rowell’s experience with fairs was limited – once as a boy of 7 or 8 he’d been to one but that didn’t stop him – so he had to start from scratch. Planning began in 1948. Commercial space was sold under a 1,300 foot tent. A cowboy act and some other entertainment was brought in. Livestock and homemaking exhibits were arranged and thus, the current day’s Fredericksburg Agricultural Fair was born. The tents were used to house the homemaking, arts & crafts, food concessions and commercial spaces. Were you there the year, the big tent blew down? Calcium chloride was used on the tent floors to keep the dust down and the fair had to pay for many a ruined shoe. The first structure, the fair office building, did not go up until the late 1950’s. Today, there is a building to house the Homemaking and Arts & Crafts and a separate building where Commercial space is rented during the fair.There is also a Cattle Barn and workshop on the grounds. Smaller structures were built to house food concessions. In the early days, the carnival was provided for many years by Dell Travers. Local merchants, such as Southern States and Roxsbury Mills, sold tickets to the rides. The fair was kicked off by a reception at the old Princess Anne Hotel followed by a big parade down Caroline Street. At the time, the area was rural and there were many farms to provide entries for cattle, poultry, vegetables, etc. Suburbia took over in the late 1980’s and farms were sold off for housing developments, but we still have livestock entries today. Over the years, the Fair was held in several locations. In 1949, the Fair moved to its present site on Routes 2 and 17. Often the heat during the fair was so bad that the flowers for the Flower Show wilted quickly as did the candles used in Arts & Crafts. In the 1960’s an unknown singer, Tammy Waynette came to perform and surprised the audience by singing some songs with her new husband, George Jones. Entertainment was also provided at the race track where Joe Chitwood was a popular driver. There was even a real helicopter ride with the door open….scary! Mary Carson, along with the assistance of Kay Jenks Davies, started the Miss Fredericksburg Fair beauty pageant for the Fredericksburg Women’s Club. Kay remembers that the pageant was rained out only twice during her tenure. The first time the pageant moved to the stage in the Homemaking building and the second time it was moved to the cattle building. Kay ran the pageant for many years and turned the duties over to Kelly Maynor, Miss Fredericksburg Fair 1984. Presently, the pageant is collaborated by Mary Cooper and her daughter Kimberly Cooper, who is a former Miss Fredericksburg Fair. In the early years, there would be more than 25 contestants. 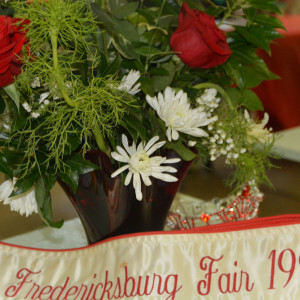 The pageant has long been a highlight of the fair, and today there is also a Junior Miss Fredericksburg Fair as well as a Pre-Teen Miss Fredericksburg Fair and Tiny Miss Fredericksburg Fair and more.Trivia: Miss America 2010, Caressa Cameron is the former 2005 Miss Fredericksburg Fair! In the 1950’s, Kathleen Howard began running the Homemaking exhibits with assistance from Elinor Dickinson and began to put together the catalog. Also, in the early 1950’s, Shirley Boggs began as Secretary for the fair and later became Kathleen Howard’s companion on one of the fair’s golf carts. Each remembers the day they took the helicopter ride and no one knew where they had gone. They also remember the day that Joe Chitwood took them for a ride in his race car and parked it in the middle of the race track so they could have the best seats for the car races. Each has spent many hours answering the phone and questions of visitors to the fair office and provided help to thousands of fair attendees over the years. In 1954, when Mr. Rowell’s job required that he travel a good deal, he gave up the presidency of the fair to Billy Wilkinson and later to George Rawlings. Mr. Rowell still remained active in the fair and resumed the presidency in 1966. Gene Rowell was the backbone of the Fredericksburg Agricultural Fair for 47 years before ending his long tenure as manager and president of the board of directors in 1996. He became President Emeritus and a permanent member of the board of directors. After attending 52 fairs, he missed Fair 2000. The “Granddaddy of the Fredericksburg Agricultural Fair” passed away in the later part of 2000. Today the Commercial Building is dedicated to him. There were many people who helped keep the fair going during those early years. Many have passed away, or can no longer volunteer, including W. J. Wilkinson, Eleanor Deichman, George Rawlings, Russell Noland, Sam Gaggett, Jimmy Pates, Tommy Goodloe, “Togo” Graves, Billy Ramey, Kathleen Goodloe, Lynnwood Garrett, Lucy Samuel, Butch Wimer and Bill Orrock just to name a few. In 1966, Richard Limerick moved his trailer on to the fairgrounds and began helping and learning about running the fair from Mr. Rowell. When Mr. Rowell retired, Mr. Limerick took over as Manager and DuVal Dickinson, who was a farmer and an exhibitor, became the Fair President. Richard remained a fixture of the fairgrounds and very active through the 2009 fair. He passed away on October 10, 2009 after a short battle with cancer. The Homermaker’s Building was dedicated to him.